The weather’s cooled down to 90+ (until next week) and there’s a gentle breeze in the air. Now’s the time to be pondering Christmas, and boy, do I have it on the brain. So, without further ado! Tah-Dah! Ok, so it’s only about halfway done in the leg part, but here’s the first stocking so far. I’m using the I Love This Yarn from Hobby Lobby. I don’t know if I really love the acrylic, but I absolutely love that it’s not hard to find the center pull. It took no effort at all, no endless mess of center yarn to detangle. It made me happy. I’ve been making very slow process with this project, not that it’s difficult. 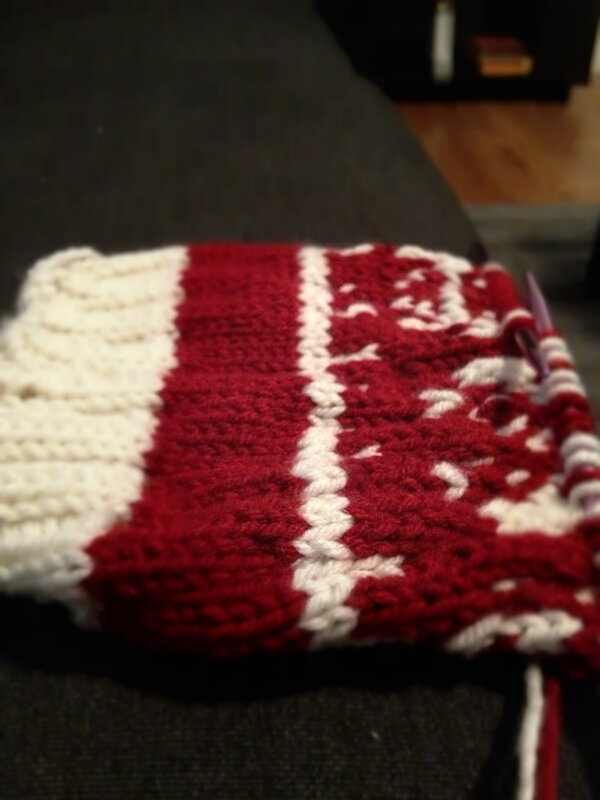 I’m doing a Norwegian star design repeated twice around the body of the stocking and then using basic sock construction but with a shorter foot piece. I think the problem is I’m reading my color chart right out of the colorwork book and the print is quite small, so it’s tiring out my eyes quite quickly. I’m also still having trouble keeping a good tension on the yarn with the stranding guide. Sometimes it’s exactly how I want it. Other times it’s too tight. I know that’ll get better with practice and once I find the best way to hold the yarn with it. Luckily, I’m going to get a lot of practice with all these stockings! And there will be plenty of time to practice this weekend as well. It’s a three day weekend! Happy Labor Day all!